With the 2014 Winter Olympics in Sochi approaching, Russian President, Vladimir Putin pushed through a vaguely-stated prohibition of so-called “homosexualist propaganda” under the hateful and prejudiced pretense of protecting the children of his country. Tosochiwithlove.com was our response to this hate. 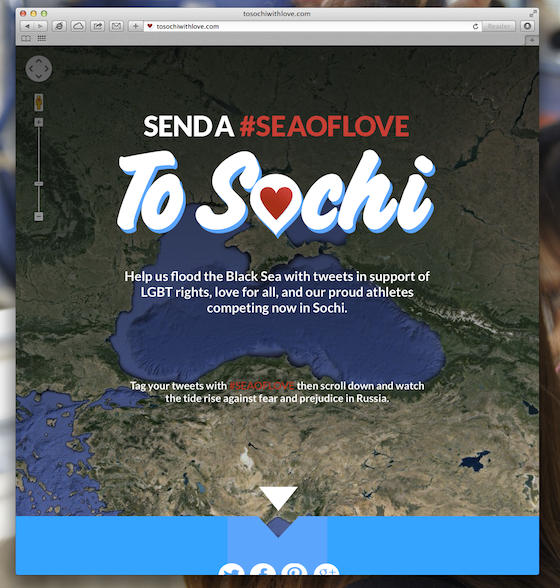 We asked people to flood Sochi with messages of love on twitter. Those who tagged tweets #seaoflove could then visit tosochiwithlove.com and watch the tide rise against fear and prejudice – a #seaoflove to drown a world of hate. Using Google Maps API to visualize the tweets, our goal was to transform the Black Sea into a #seaoflove in support of LGBT rights in Russia and everywhere. By that standard, and by every analytic measure, the effort was a failure. It garnered only 1,856 visits in its two weeks live. Only 1,457 of them unique. But in so many other ways, it represented an amazing victory. Thanks to the hard work of a very small team of friends from Arnold in Boston, tosochiwithlove.com went from initial concept to completion in just under five days. We launched the effort just in time for the Games, on a Saturday night, without a client, a sponsor, or a single media dollar, just loads of heart and the power of our own social networks. We made phone calls and emails in pursuit of the last-minute support of the Human Rights Campaign with the enthusiastic support of their man Paul Mataras in Boston, but ultimately couldn’t secure it on time. We direct-messaged Australian snowboarder and outspoken gay Olympian, Belle Brockhoff, and in response, she RT’d us four times – including a pair on Valentine’s Day. We hustled for every tweet we got, and we got a few. Even a few from within Russia. In the end, while it didn’t catch fire, it never once felt like anything less than a 100% worthwhile expenditure of time and effort. Today, February 25, 2014 we took down tosochiwithlove.com. But the struggle for basic human rights continues around the world. Dave Cliff, Cass Taylor, Alicia Foor, Ebbey Mathew, Pawel Micolajczyk, Liz Kavanaugh, Deb Grant, Wade Devers and Pete Johnson: a #seaoflove to you all.